I'm selling it because I changed my set Audio. Never in concert with, Non smoking studio. Octatrack modified by a former French engineer of "Atoll Electronique"
I own an amplifier from Atoll electronique, they make quality product, mostly audiophile stuff. Can you give me some advice how did you modified it? What is the value of the output caps? Man, I really want to do this upgrade, too! I'm the guy who have done this modification. This mod is complex. I have intercepted the digital stream between the DSP and the audio codec. Then a FPGA and a DIR (on the bootom of the yellow board) encode the I2S to a SPDIF signal. 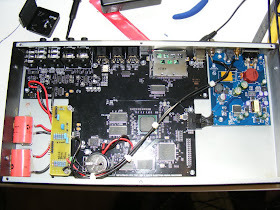 I also have added a coax connector that outputs the master clock to be compatible with pro audio gears. You can contact me at neteagle@free.fr if you are interressed in this mod.